This paragraph, an excerpt from the very thoughtful article Tourism as Direct Trade, could barely be expressed any better. Using local resources when you travel is one of the key essentials of responsible tourism. It not only helps local communities sustain themselves, it can also encourage them to value their traditions more – after all, the tradition is a big part of what we come to see. And, most importantly, if you truly want to get to know a country, a people, a community, the only way to go is to meet the locals. So stay with the locals, take a local guide (he knows all the secret spots your travel agent at home has never heard of), and try the local food. Who would be better to show you a country than the people who live there, who love it, and who care about its preservation, because they know their children will grow up there? And who would be better off to take your tourist dollars than the people whose land you walk on, whose hospitality you enjoy? The idea is to establish flexible-frequency (with seasonal differences in frequency) air traffic connections to various inland and Latin America destinations, to allow customers to book hotels or rental cars in addition to their flight, and also to offer the possibility of charter flights. Vision Panama will operate 3 Boeing 767’s, one of which will be equipped with all-business seats for charter, several Boeing 737’s, and various smaller aircraft for regional flights. Proposed destinations outside of Panama include Sao Paulo, San Jose, Caracas, Cancun, Lima, Bogota, Punta Cana and several US destinations. The founding company Vision Airlines started up in the US in 1994 focusing primarily on charter flights, among them tour flights for aerial views of tourist destinations such as the Hoover dam and Grand Canyon. Since 2011 the company is also running scheduled services within the US. Panama Aircraft Rental & Sales are an established provider of airplane charters in Panama and provide, among other things, aerial tours of the Panama Canal. The availability of additional aircraft for popular inland destinations such as San Blas or Bocas del Toro, as well as the added accessibility of affordable flights into the country from major cities in the US and Latin America would add substantial carrying capacity for leisure and business travelers and could increase tourism to and inside Panama significantly. The proposal also includes the plan to support the development of Panama Pacifico airport. This new venture is a great and exciting opportunity for Panama’s tourism industry, which could end up providing Panama’s greatest destinations with better access, infrastructure and further opportunity. As of January 17, tourists entering Panama through Tocumen International Airport will have what the Tourism Authority is calling free insurance. The insurance provides insurance for 30 days, Salomon Shamah, Tourism Aurthority head, had said in a press conference. The government signed a two-year contract with Assicurzioni Generali for $8 million. “The idea of a medical emergency insurance for tourists who visit us is to raise the quality of what is offered to the people who come to Panama,” said Shamah. 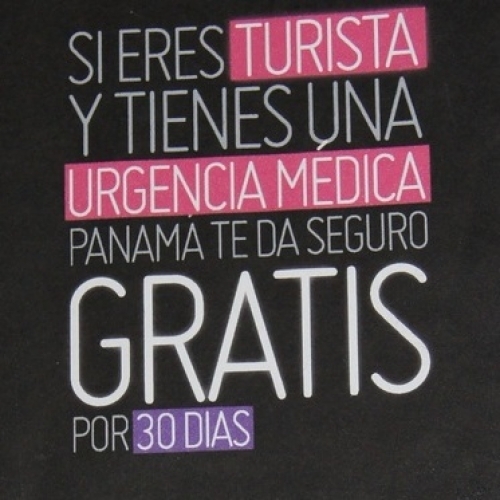 Tourists and Panamanians living abroad will receive a booklet that includes a removable card with insurance details. The benefits include coverage of up to $20,000 to repatriate the tourist’s dead body, $7.000 for a week of hospitalization, $2,000 for dental emergencies, $3,500 for legal services, up to $40,000 in air ambulance service and $500 to $1,000 for drug prescriptions. According to Panamanian authorities, around 1.05 million visitors entered the country through Tocumen between January and November 2010, representing 70 percent of the 1.5 million people that enter Panama through the various ports of entry. The $2 charge for the insurance is already included in the $40 airport taxes paid by all travelers. You as a traveler upon arrival contact the Tourism Bureau kiosk to activate your insurance.